Miesorski, M.; Borgelt, L.; Liebold, M.-A. ; Vollmar, B.; Gerlinger, C.; Oster, M.; Wimmers, K.; Wolf, P. (2018): Composition of different types of bones in weaned piglets supplied with graded dietary phosphorus levels. Soc. Nutr. Physiol. 27: 102.
Zimmer, D.; Kruse, J.; Siebers, N.; Panten, K.; Oelschläger, C.; Warkentin, M.; Hu, Y.; Zuin, L.; Leinweber, P. (2018): Bone char vs. S-enriched bone char: Multi-method characterization of bone chars and their transformation in soil. Science of the Total Environment 643: 145-156, DOI: 10.1016/j.scitotenv.2018.06.076. Bathmann, U. and Krämer, I. 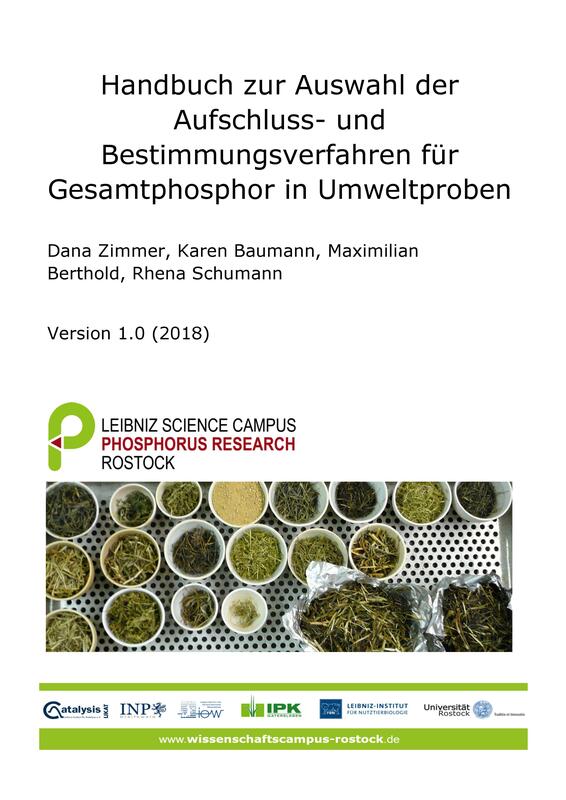 (2017): Leibniz ScienceCampus Phosphorus Research Rostock: Towards sustainable phosphorus management. In: Living along gradients: past, present, future. The 11th Baltic Sea Science Congress, Rostock, June 12-16, 2017 : Abstracts. Leibniz Institute for Baltic Sea Research (IOW): 301. Klehr, W., Koegst, T., and Tränckner, J. (2017): Longitudinal monitoring of surface water quality. In: Living along gradients: past, present, future. The 11th Baltic Sea Science Congress, Rostock, June 12-16, 2017 : Abstracts. Leibniz Institute for Baltic Sea Research (IOW): 262. Knaus, U.; Palm, H.W. (2017): Effects of fish biology on ebb and flow aquaponical cultured herbs in northern Germany (Mecklenburg Western Pomerania). Aquaculture 466: 51-63. Koegst, T., Cramer, M., Traenckner, J. (2017): Phosphorus removal potential of small waster water treatment plants in the sub-catchments of the Baltic Sea. In: Living along gradients: past, present, future. The 11th Baltic Sea Science Congress, Rostock, June 12-16, 2017 : Abstracts. Leibniz Institute for Baltic Sea Research (IOW): 303. Köhn, J.; Zimmer, D.; Leinweber, P. (2017): Phosphorus economics - a review. Mechanism of Economic Regulation 01/2017: 6-25. Lipka, M., Schneider, J., Schmiedinger, I., Westphal, J., Escher, P., Sültenfuß, J., Dellwig, O., Winde, V., and Böttcher, M.E. (2017): Groundwater discharge into the Southern Baltic Sea: an open coastal interface. In: Living along gradients: past, present, future. The 11th Baltic Sea Science Congress, Rostock, June 12-16, 2017 : Abstracts. Leibniz Institute for Baltic Sea Research (IOW): 152. Mahnke, B.; Wrage-Mönnig, N.; Leinweber, P.; Müller, J. (2017): Phosphor im Grünland – Antrieb der Leguminosen, aber Bremse der Phytodiversität?. In: Wolfrum, Sebastian; Heuwinkel, Hauke; et al. (Hrsg.). Ökologischen Landbau weiterdenken: Verantwortung übernehmen, Vertrauen stärken. Verlag Dr. Köster, Berlin, S. 372-375. Vogel, T.; Kruse, J.; Siebers, N.; Nelles, M.; Eichler-Löbermann, B. (2017): Recycled Products from Municipal Wastewater: Composition and Effects on Phosphorus Mobility in a Sandy Soil. Journal of Environmental Quality 46 : 443-451. Bauwe, A.; Kahle, P.; Lennartz, B. (2016): Hydrologic evaluation of the curve number and Green and Ampt infiltration methods by applying Hooghoudt and Kirkham tile drain equations using SWAT. Journal of Hydology 537: 311-321. Cramer, M.; Koegst, T.; Tränckner, J. (2016): Cost-efficient Phosphorus removal in rural WWTPs. In: Proceedings of the 13th IWA Specialized Conference on Small Water and Wastewater Systems., Athens, Greece. Ekardt, F. (2016): Theorie der Nachhaltigkeit, 3. Aufl., Nomos Verlag. Koning, L.A.; Sefzat, D.; Gerowitt, B. (2016): Exploring the effects of glyphosate products on weed composition. Julius-Kühn-Archiv 452: 270-278. Koning, L.A.; Sefzat, D.; Gerowitt, B: (2016): Does a glyphosate-induced weed shift exist in northern Germany’s winter wheat?. Proc. 7th Int. Weed Science Congress, 160. Mahnke, B.; Müller, J.; Wrage-Mönnig, N. (2016): The effect of soil P on legume distribution and biodiversity on small spatial scales. Grassland Science in Europe 21: 690-692. Palm, H., Bischoff, A. (2016): Aquakultur – quo vadis?. Biologie in unserer Zeit 02/2016: 118-125. Palm, H.W. ; Strauch, S.; Knaus, U. ; Wasenitz, B. (2016): Das FischGlasHaus – eine Innovationsinitiative zur energieund nährstoffeffizienten Produktion unterschiedlicher Fisch- und Pflanzenarten in Mecklenburg-Vorpommern („Aquaponik in MV“). Fischerei & Fischmarkt in MV 01/2016: 38-47. Wolf, P., Borgelt, L., Polley, C., Vollmar, B., Oster, M., Wimmers, K. (2016): Knochendichte und -zusammensetzung von Absetzferkeln bei unterschiedlicher P-Versorgung. In: Deutsche Veterinärmedizinische Gesellschaft: Tierernährung für Tierärzte - Im Fokus: Die Fütterung von Schweinen. ISBN 978-3-86345-309-1, S. 157-164. Zacher, A.; Baum, C.; de Mol, F.; Dehmer, K.-J. ; Gerowitt, B: (2016): Mechanisms of P mobilization in the rhizosphere involving weeds and crop plants. Proc. 7th Int. Weed Science Congress, 42. Baum, C., Zacher, A., Mahnke, B., Müller, J., Leinweber, P. (2015): Einfluss von Vegetationszusammensetzung und P-Düngung auf Mykorrhizierung und P-Mobilisierung unter Grünland. Unsere Böden – Unser Leben, Tagungsband DBG 5.-10.09.2015, München. Bitschofsky, F., Forster, S., Powilleit, M. & Gebhard, C. (2015): Potential role of macrofauna for the exchange processes between sediment and wa-ter column in an inner coastal water of southern Baltic Sea (Darß-Zingst Bodden Chain, Grabow). Rostocker Meeresbiologische Beiträge 25: 27-39. 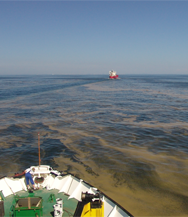 Forster, S., Bitschofsky, F. (2015): Different reasons for low pore water phosphate concentrations observed at a shallow brackish site in a German Baltic Sea lagoon. Rostocker Meeresbiologische Beiträge 25: 119-131. Grünes, J., Nelles, M. (2015): Status, potentials and perspectives of the recycling of phosphorus from organic waste and residues in Mecklenburg-Western Pomerania. In: Akinci, G.; Güven, D.; Bölükbas, A. (Hrsg. ): TAKAG 2015, VI. Deutsch-Türkische Abfalltage, 26.-29. Mai 2015 in Izmir/Türkei, 178-184. Grünes, J., Nelles, M. (2015): Aspects and Potentials of the Phosphorus Recycling from Organic Waste and Residues in Germany. In: iwwg-ARB (Ed.) 2nd Symposium of Asian Regional Branch of International Waste Working Group, 12.-15. April Tongji – Proceeding Book, 208-210. Grünes, J., Nelles, M. (2015): Aspects and Potentials of the Phosphorus Recycling from Organic Waste and Residues in Germany. iwwg-ARB (Ed.) 2nd Symposium of Asian Regional Branch of International Waste Work-ing Group, 12.-15. April Tongji – Abstract Book, 108. Grünes, J.; Nelles, M. (2015): Phosphor-Recycling aus organischen Abfällen und Reststoffen – Stand Potenziale und Perspektiven in Mecklenburg-Vorpommern. In: Bockreis., A.; Faulstich, M.; Flamme, S.; Kranert, M.; Mocker, M.; Nelles, M.; Quicker, P.; Rettenberger, G.; Rotter, V.S. (Hrsg. ): 5. 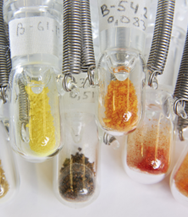 Wissenschaftskongress Abfall- und Ressourcenwirtschaft, 19.-20.03.2015 Innsbruck – Tagungsband, S. 73-77. Mahnke, B., Thun, A.S., Müller, J., Wrage-Mönnig, N. (2015): Zusammenhang zwischen Phosphorgehalten in Grünlandaufwüchsen, nutritiven Qualitätsparametern und der Phänologie der Hauptbestandesbildner im ökologischen Landbau. In: Mitteilungen der Arbeitsgemeinschaft Grünland und Futterbau: Grünland effizient und umweltschonend nutzen. Tagungsband der 59. Jahrestagung der AGGF. – ISBN 978-3-00-049985-2, S. 130 - 133. Nelles, M., Grünes, J. (2015): Recycling of Phosphorus from Organic Waste and Residues – Status, Potentials and Perspectives in Germany. In: Wong, J.; Rajeshwar, D. T.; Nelles, M.; Selvam, A. (Eds. ): International Conference on Solid Waste 2015 – Knowledge Transfer for Sustainable Resource Management, 19-23 May 2015 Hong Kong Conference Proceedings Vol. 1, 64-67. Palm, H., Nievel, M., Knaus, U. (2015): Significant factors affecting the economic sustainability of closed aquaponic systems. Part III: plant units. Aquaculture, Aquarium, Conservation & Legislation - International Journal of the Bioflux Society 8: 90-106. Vassilev, N., Vassileva, M., Lopez, A., Martos, V., Reyes, A., Maksimovic, I., Eichler-Löbermann, B., Malusà, E. (2015): Unexploited potential of some biotechnological techniques for biofertilizer production and formulation. Applied Microbiology and Biotechnology 99 (12: 4983-4996. Bachmann, S., Gropp, M., Eichler-Löbermann, B. (2014): Gärreste – Phosphor und Kalium gut verfügbar. Land & Forst: Landwirtschaft und Landleben in Niedersachsen 33: 32-33. Bachmann, S., Gropp, M., Eichler-Löbermann, B. (2014): Phosphorus availability and soil microbial activity in a 3 year field experiment amended with digested dairy slurry. Biomass & Bioenergy 70: 429-439. Grünes, J., Xu, A., Nelles, M. (2014): Verwertung von Phosphor aus organischen Abfällen und Reststoffen. Müll und Abfall Ausgabe 06: 323-329. Palm, H., Bissa, K., Knaus, U. (2014): Significant factors affecting the economic sustainability of closed aquaponic systems. Part II: fish and plant growth. Aquaculture, Aquarium, Conservation & Legislation - International Journal of the Bioflux Society Vol. 7, Is:. Palm, H., Seidemann, R., Wehofsky, S., Knaus, U. (2014): Significant factors affecting the economic sustainability of closed aquaponic systems. 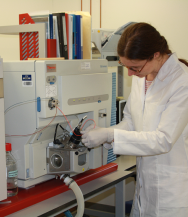 Part I: system design, chemo-physical parameters and general aspects. Aquaculture, Aquarium, Conservation & Legislation - International Journal of the Bioflux Society Vol. 7, Is:. Siebers, N., Godlinski, F., Leinweber, P. (2014): Bone char as phosphorus fertilizer involved in Cd immobilization in lettuce, wheat, and potato cropping. Journal of Plant Nutrition and Soil Science 177: 75-83. Vágó, I., Sipos, M., Tolner, L., Eichler-Löbermann, B., Czinkota, I. (2014): Dynamics of dry matter production and potassium uptake of maize in a long-term field experiment on chernozem soil. Agrokémia és talajtan 63: 149-158. Almethyeb, M., Ruppel, S., Paulsen, HM, Vassilev, N., Eichler-Löbermann, B. 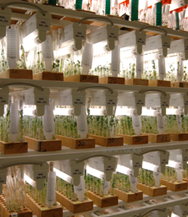 (2013): Single and combined applications of arbuscular mycorrhizal fungi and Enterobacter radicincitans affect nutrient uptake of faba bean and soil biological characteristics. Landbauforschung - Applied Agricultural and Forestry Research 63: 229-234. Busch, S., Brandt, C., Eichler-Löbermann, B. 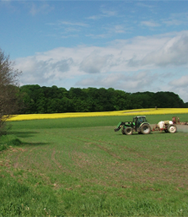 (2013): Phosphorus status of agricultural soils in Germany. Baltic Manure WP4 Standardisation of manure types with focus on Phosphorus. Müll und Abfall. Najjar, G., Godlinski, F., Vassilev, N., Eichler-Löbermann, B. (2012): Dual inoculation with Pseudomonas fluorescens and arbuscular mycorrhizal fungi increases phosphorus uptake of maize and faba bean from rock phosphate. Landbauforschung - vTI Agricultural and Forestry Research 62: 77-82. Siebers, N., Godlinski, F., Leinweber, P. (2012): Utilization of bone char phosphorus for potato, wheat, and onion production. Landbauforschung - vTI Agricultural and Forestry Research 62: 59-64. Brandt, C., Balko, C., Eichler-Löbermann, B. (2011): Interactive effects of soil water content and phytin supply on phosphorus nutrition of different crop species. Landbauforschung - vTI Agricultural and Forestry Research 61: 317-326. Ekardt, F. (2011): Theorie der Nachhaltigkeit: Rechtliche, ethische und politische Zugänge - am Beispiel von Klimawandel, Ressourcenknappheit und Welthandel., Nomos Verlag. Ekardt, F. Holzapfel, N., Ulrich, A., Schnug, E., Haneklaus, S. (2011): Sustainability, Land-use, and Soil Protection. A Legal Perspective. Landbauforschung - vTI Agricultural and Forestry Research 83-103. Ekardt, F., Holzapfel, N., Ulrich, A. E., Schnug, E., & Haneklaus, S. (2011): Legal perspectives on regulating phosphorus fertilization. Landbauforschung - vTI Agricultural and Forestry Research 61 (2&: 83-92. Godlinski, F., Aust, M.-O., Travis, G., Hao, X., Thiele-Bruhn, S., McAllister, T. A., Leinweber, P. (2011): Phosphorus and trace metal distribution under confined cattle feeding operations in Southern Alberta. Landbauforschung - vTI Agricultural and Forestry Research 61: 249-260. López, R., Samson, R., Van Damme, P., Eichler-Löbermann, B., Gómez, E. (2011): Response of Rhizobium - Clitoria ternatea combinations under salt stress in the Cauto Valley Cuba. Técnica Pecuaria en México 2: 199-207. Müller, K. (2012): Phosphatlimitierung und Phosphataufnahme im Cyanobakterienplankton der Darß-Zingster-Boddenkette. Diplomarbeit an der Universität Rostock.